Eating out in Central Florida is easy at these 55+ communities. The Orlando area brims with active adult communities that have every amenity you can think of. From shuffleboard to pickleball, golf to tennis, resort-style pools and enormous clubhouses, you can have a hard time choosing one to like better than the others. 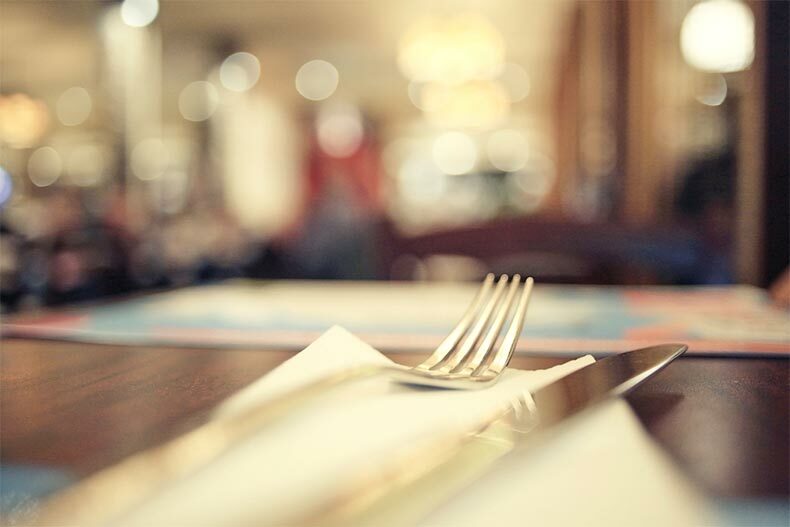 If food factors into your decision, consider a 55+ community with its own restaurant. This is an especially great amenity for those days that you don’t feel like cooking but you also don’t want to drive out into the city for some good eats. These are a few communities in the Orlando/Kissimmee area that provide a perfect blend of going out and staying in. One of the newer 55+ communities to establish itself in the Orlando area is Four Seasons at Orlando, located in Kissimmee. The restaurant you’ll want to try is Kenzie’s Restaurant, located inside the Mystic Dunes clubhouse. It was awarded a Diner’s Choice Award in 2018 by OpenTable. The environment is comfortable and family-friendly for the daytime, and if you want to enjoy happy hour or a cocktail, you’re invited to slip into the lounge. Four Seasons at Orlando also offers a state-of-the-art fitness center, an outdoor pool, tennis courts, pickleball courts, a dog park, and walking paths. Mystic Dunes is an 18-hole championship golf course, and for those who take their golf game a little less seriously, an 18-hole miniature golf course is also available. Buyers can select from the 530 new homes under construction in a number of sizes and floor plans. At Del Webb Orlando, residents can relax in the Cyber Café Coffee Bar and enjoy a latte and a muffin or make a reservation for Champions Grille, the restaurant found at Ridgewood Lakes, the community’s golf course. There’s indoor and outdoor seating serving American-style food in a golf-themed setting. They also offer the venue for banquets and special events. In addition to the restaurant, the golf club provides residents with an opportunity to play on the 18-hole golf course designed by Ted McAnlis. There’s also a putting green, a driving range, and a pro shop. Other amenities in this gated, 55+ community include a fishing dock, horseshoe pits, RV parking, and ample trails for biking and walking. There are 830 new and resale single-family homes available for buyers, all of them ranging in size from 978 square feet to 2,251 square feet. If casual dining is your favorite way to eat, check in at the Lake Nona Deli & Market, found at VillageWalk at Lake Nona. This community of single-family homes and townhouses is not age restricted, so you can move in with and host family members of all ages. In addition to the deli, residents enjoy a catering kitchen at the clubhouse, which inspires a regular fish fry and other events such as seasonal parties and potlucks. Residents of VillageWalk at Lake Nona also enjoy basketball, dancing, and swimming. There’s a large town center, a state-of-the-art fitness center, a gas station, and a day spa. It’s possible to run errands, get a bite to eat, and have your pet groomed while you’re at the on-site salon. Several dining options exist at Cresswind at Victoria Gardens, a 55+ community in Deland. The Club at Victoria Gardens is a 20,000 square-foot clubhouse which includes The Clubhouse Café, where it’s easy to grab a coffee or a sandwich. At The Village Center, residents can enjoy the restaurant and several shops. There’s also a bank, a hair salon, a place for dry cleaning, and a nail salon. This gated community offers over 1,000 new and resale single-family homes. The best place to eat within Cresswind at Victoria Gardens, however, is Sparrow’s Grille, a restaurant at Victoria Hills Golf Club. Diners enjoy lunch, dinner, and Sunday brunch. There’s an extensive wine list, weekly events, and a venue to hold parties and banquets. One of the most sought-after active adult communities in the Orlando area is Solivita, a remarkable collection of 5,900 single-family and attached homes that are available as new or as resale properties. The local restaurants are all found at Stonegate Golf Club. There’s the elegant Mosaics Restaurant, which has an extensive menu and offers themed menus for parties and group dining experiences. There’s also The Grille, which feels like a sports bar and serves breakfast, lunch, and dinner. The Marketplace Bistro serves casual sandwiches, salads, drinks, and snacks, and is open from breakfast until dinner. In addition to excellent restaurant options, Solivita provides residents with everything they could possibly need to live successfully and happily in Central Florida. A sports complex includes shuffleboard, softball, pickleball, and tennis. There are pools, sundecks, and fitness centers with exercise studios. Residents participate in more than 50 activities and clubs.